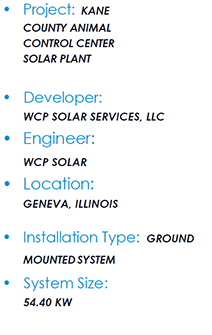 WCP Solar was contracted to design and construct a ground mounted solar system for The County of Kane in the city of Geneva, for the Kane County Animal Control Center. This City of Geneva grid connected Distributed Generation system will generate enough electricity to provide power to more than 95% of the facility electrical needs. This project is sized at 52.80-kWp1, using 160 GCL 330-72M Monocrystalline panels rated at 330-W for the ground mounted solar system. The system employs 2 SMA-24000TL string inverters appropriately sized to convert the DC energy produced by the solar plant into AC energy. In addition to providing significant energy savings, the solar system will produce approximately 72 Solar Renewable Energy Credits (SREC's) annually. A favorable financing Agreement for 20 years was forged with The County of Kane saving more than 95% of their current utility energy rates. The WCP Solar construction management team will oversee all phases of the construction process, including the day to day operations, weekly subcontractor, and Owner meetings, site monitoring, quality assurance and control, and scheduling. Estimated completion date December 2018.